By Thomas Hale, a Postdoctoral Research Fellow at the Blavatnik School of Government, Oxford University. This article was first published by chinadialogue. Li Shuo of Greenpeace China has recently argued on chinadialogue that U.N. climate talks can drive more ambitious greenhouse gas (GHG) reductions in China, the world’s largest emitter. This optimism goes against much of the conventional wisdom regarding the negotiations. Despite twenty years of global summits, global emissions are still increasing at an unsustainable rate, including in China. 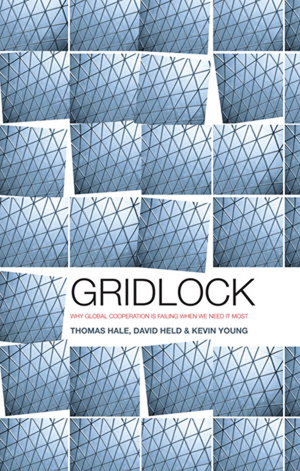 My colleagues David Held, Kevin Young, and I argue in our new book Gridlock: Why Global Cooperation Is Failing when We Need It Most, that this failure of multilateralism is just one manifestation of a system-wide pathology. Whether it is Syria, trade talks, or financial regulation, countries are unable to agree on the global rules needed to manage transnational threats like climate change. The same broad causes have led to gridlock across different issues: the rise of new powers with more diverse interests, the emergence of harder problems— like climate change— that require deeper policy changes at the domestic level, and institutional inertia and fragmentation in global governance. Ironically, many of these processes have their origin in the previous success of international cooperation in building a more integrated world economy over the postwar period. How should we assess Mr. Li’s claim that the U.N. climate talks, gridlocked though they may be, can drive action in the world’s largest emitter? Mr. Li suggests that key summits like the 2009 meeting in Copenhagen or the 2011 meeting in Cancun led the Chinese government to adopt domestic carbon- and energy-intensity targets more rapidly than it otherwise would have. This may very well be true, although it is impossible to say for sure. But even if UNFCCC summits have accelerated Chinese commitments by a few years, that is a relatively modest achievement. Recognizing these kinds of limits to international influences on policy in China— and in other large countries— is crucial. Actors outside of China (including governments, environmental groups, companies, international organizations, etc.) can play an important role in helping the Chinese government achieve its goal of reigning in GHGs. But they— just like actors within China— will only be effective if they act strategically within the domestic policy context. Share knowledge and technical capacity. Pro-climate actors in China have learned substantially from foreign experience with different regulatory approaches, and this enhanced capacity has given them more leverage in domestic policy debates against anti-regulation interest groups. A key example is emissions trading. Carbon markets are difficult to do well. Regulators need to measure emissions accurately, establish and maintain a price that is neither too high nor too low, and build capacity in firms to manage their emissions efficiently. It is therefore essential that China, which stumbled setting up a similar scheme for sulfur dioxide emissions, takes advantage of the most advanced regulatory methods available. Outside groups have been crucial to this process of “policy technology transfer.” China’s first voluntary carbon exchanges were created with the help of foreign NGOs. These groups have worked closely with colleagues in the Chinese government to design China’s seven pilot emissions trading systems that launched this year. And just last week, the state of California and the city of Shenzhen, the first of the pilot projects agreed to share technical expertise in emissions trading. The recent U.S.-China deal to seek regulation of HFCs under the Montreal Protocol is a good example of how international factors can help. As Melanie Hart of the Center for American Progress suggests in an excellent report, the Xi-Obama Sunnylands summit gave the National Development and Reform Commission, the agency with most power over climate policy, additional space and leverage to side with the pro-regulation bureaucracies against the anti-regulation state-owned enterprises. The need to show results at the summit was just the right amount of external incentive for the right actors at the right time. Do not apply pressure that is detached from domestic policy debates. Conversely, outside pressure applied without consideration for domestic politics tends to fail. Consider the E.U.’s ill-fated attempt to regulate the emissions of foreign airlines flying European routes. The measure aroused stiff opposition in China (and in India and the United States), where it was seen as a unilateral infringement on highly visible and prestigious Chinese companies that enjoyed support in important ministries. Worse, the action did little to strengthen pro-climate forces within the Chinese policymaking apparatus, because airline emissions were not a topic of domestic discussion. Instead, the E.U.’s move reinforced the damaging idea that climate action is a foreign priority forced on China by the West, arguably making it more difficult for pro-climate arguments to gain traction within China. The Way Forward For the U.N. In sum, foreign actors need to understand the domestic constraints to what they can contribute to Chinese climate policy, as with any large country. What role is there for the gridlocked UNFCCC negotiations? Instead of trying to agree on ambitious targets that are assigned to countries for implementation, the multilateral framework should aim to create the conditions under which national policies— and actions by sub- and non-state actors— will be as ambitious as possible. Second, the pledge and review process can be expanded to include the commitments of sub- and non-state actors like cities, regions, provinces, and industries. The more actors within countries agree to tackle climate change, the better chance they have to drag the rest of the country along with them. This trend is abundantly clear in the United States, where cities and states are far ahead of the federal government. The UNFCCC can help by legitimizing these actions, publicizing them, and connecting them to the resources they need to expand in scale. It can also create a path toward eventually legalizing these voluntary pledges. Enshrining commitments under international law can have two benefits: reinforcing the reciprocal nature of countries’ climate policies, and helping to “lock in” commitments by giving pro-climate actors in countries another argument to deploy against domestic opponents who would roll them back. Finally, the multilateral process is crucial as the only forum in which small states— many of which will suffer the most from climate change— can make their voices heard. This is essential not just for the legitimacy of global climate governance, but also for mobilizing the financial assistance for adaptation that will be required even under the best scenarios. Global governance may be gridlocked, but global threats like climate change are too important to be left to multilateral negotiations alone. Instead, the challenge is to move domestic policies forward in key countries. International networks and the UNFCCC process can help, but only if they take domestic politics seriously.